The Illinois Council of Teachers of Mathematics (ICTM) annual meeting kicks off tomorrow in my hometown of Peoria, Illinois. I’m actually the co-chairman of the meeting, so I’ll be there throughout, and I plan to do at least one post about the meeting. 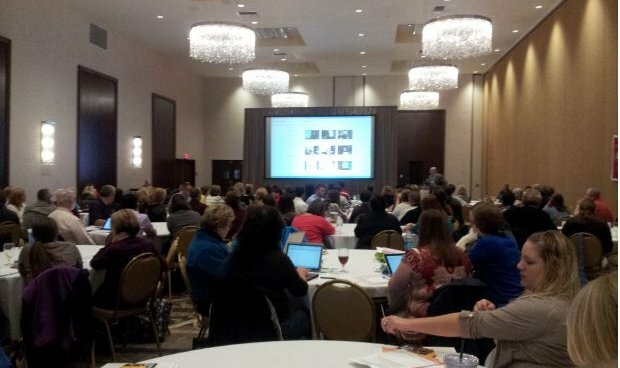 For the most dedicators math educators, there was actually a pre-conference today. I hadn’t planned on posting about that, but something came up this morning that I couldn’t pass up. The focus of the pre-conference was the new PARCC (Partnership for the Assessment of Readiness for College and Careers) assessment, which is a test that’s going to be used by close to 20 states to assess the Common Core State Standards (CCSS). Throughout the day, we heard from several speakers about how the PARCC test is continuing to be developed on a national level, and how Illinois is planning to implement it on a state level. Many of the ideas behind the PARCC assessment are truly great. The questions that students will be assessed with require a much higher level of thinking than traditional standardized tests. There will be fewer questions that take more time, and more time will be given, so that students aren’t just racing to complete many low-skill level problems in a short amount of time. What can be disconcerting to those of us in the classroom is how many unanswered questions there still are about the PARCC test, despite the fact that it’s being rolled out in 2014-15. This morning, we heard from Heather Brown, Illinois State Board of Education Math Content Specialist, about the new PARCC assessment. There were a number of tough questions asked this morning about how PARCC tests will be implemented that Brown simply had to answer, “That hasn’t been decided.” However, the one I’d really like to highlight is calculator use. For some time now, the stated policy has been that the PARCC test, a test which will primarily be given via computer, will have an online calculator with “TI-84 like capabilities.” Brown reiterated that rather vague explanation today, which is one I’ve heard on many occasions. She also explained to anyone that hadn’t heard that it is still up for debate whether students will be allowed to bring their own graphing calculators to the test. Here’s some additional information she added I hadn’t heard before. Since PARCC is a consortium of states, all decisions about the test are reached by consensus. Many of the PARCC states are specifically pushing for outside graphing calculators to be banned. She didn’t actually say this, but something about her tone made me think that perhaps a majority of PARCC states feel this way. Brown said that she, personally, is pushing the other way, at least for the first few years of the PARCC tests. For the schools that do not take the PARCC assessment online (paper and pencil schools), students will likely be allowed to bring their own graphing calculators. While she wanted to be clear that she was not making an announcement, Brown said that it was almost certain that the PARCC assessment’s online calculator would not have CAS (computer algebra system) capabilities. By this point, there was quite a bit of grumbling around the room from a group of educators that had remained perfectly silent through the first 45 minutes or so of the presentation. If you don’t understand the frustration, let me break it down for you. The online calculator with “TI-84 like capabilities” hasn’t been released for the public to see. So even though the PARCC test starts next year, we have no way to prepare our kids for the technology tool they’ll be using on the assessment. It sounds as though the testing rules may not even be consistent. Schools that use paper and pencil tests might be allowed to bring in their calculators while schools with computer testing wouldn’t. I don’t understand how such a policy could be considered fair. At this point in Brown’s talk, a member of the audience rose to interrupt her. He asked her to please, go back to the “higher ups” and plead with them not to eliminate the use of the CAS from testing. He said that the CCSS themselves encourage students to use a CAS to solve problems (he’s right), so it’s hard to understand why a test designed to assess CCSS would ban the use of a CAS. He said that “probably 70% of the world’s mathematicians” use a CAS of some sort in their work to solve problems and that research shows that it enhances, not damages, student understanding. When he finished speaking, about half the audience broke into applause. Brown encouraged him to email her the research that he was referring to so she could share it. I hope PARCC gets their calculator policy right, but what I heard today leaves me with my doubts, and that makes me nervous. Once a standardized testing authority sets down a calculator policy, it may as well be written in stone. As far as I know, ACT has never considered revising their ban on CAS calculators. Rumor has it that the College Board may soon overturn its outdated ban on touch screen calculators for the SAT and AP tests, but it’s been in place for well over a decade. I applaud PARCC for including an online graphing calculator with their assessment, but until I see it, I will question whether it will be on par with the handheld units from the graphing calculator manufacturers. Unless it is really stripped down (in which case it won’t be “TI-84 like”), it won’t be something you can just teach kids in a single class period. At my school, we spend years training our kids to be expert problem solvers on the TI-Nspire. How much time will we need to spend teaching them an additional calculator, one that won’t be allowed on tests like the ACT, SAT, or AP tests? Like anything else, the greatest burden will be faced by the weakest students since they don’t adapt to new technologies as rapidly as top students. Those of you that have seen any of the sample PARCC assessment test questions know that it is going to be a very difficult series of tests. Why add to the stress and anxiety that goes along with such a test by taking away a learning tool like the TI-Nspire, TI-84 Plus, or Casio Prizm that a student has potentially spent 3 or 4 years building a comfort level with? PARCC should focus their efforts on writing a great assessment, something I believe they are doing, and leave graphing calculator design to the pros at Texas Instruments, Casio, and HP.